Here's an Xmas gift from me to all of you, my facebook friends and family. You can download the Kindle version of Dr. Gregory Arana's cookbook "I Belize you can cook" on Amazon for free today. Have you ever wondered where you could find a good recipe for delicious Belizean food? Have you ever craved some panades, rice and beans, or tamales; even though you are thousands of miles away from the nearest Belizean restaurant? Are you a Belizean by birth, Belizean by association or simply curious about the food and culture of this exotic tropical paradise? Then: I believe you can cook with this Caribbean cookbook. 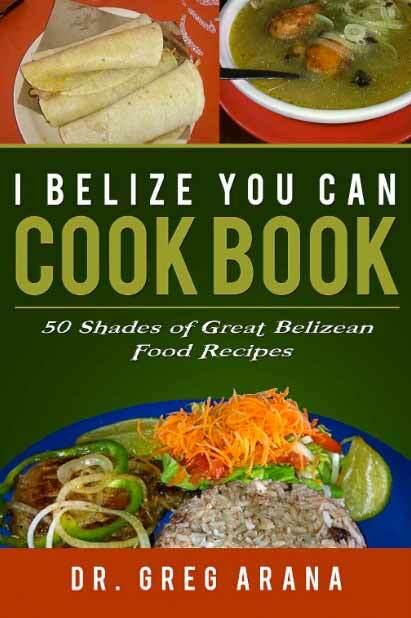 You have just found fifty shades of great Belizean recipes for your culinary enjoyment and pleasure. Belize, formerly known as British Honduras, is a jewel of the Caribbean in the heart of Central America. One of the great things about our country is that Belize is a melting pot of food and culture. The settlement of Belize was governed by the Governor of Jamaica at one point in our history. Belize has a strong connection to the Caribbean in terms of food and culture. Many of our dishes are similar to Jamaican food. Belize is located on the east coast mainland of Central America east of Guatemala and north of Honduras. Belize is a few hours drive south of Cancun, Mexico. The Latin influence on our cuisine is also strongly present. Tacos, burritos and tamales can be found and enjoyed everywhere in Belize… but with uniquely Belizean style of cooking and flavor. The 50 Belizean recipes in this cookbook are basic enough for the beginner to easily follow, prepare and enjoy. They can also be a starting point for the guerrilla gourmet who is seeking a unique culinary adventure and exotic tropical inspiration. Wherever you are in the world, here is the solution for your craving of authentic Belizean food. Here is your guide to enjoy fry jacks for breakfast. Have some rice and beans and Belizean stew chicken for lunch. This book makes it possible for you to savor Belizean meat pies, panades and tamales tonight for dinner. You may even consider having some Pibil… the famous “underground pork” of the Yucatan Maya Indians. If stomach space allows, don’t forget to feed your weakness for Belizean sweetness. Imagine yourself on a Belizean “dessert” island. Mouth- watering bread pudding, cassava cake, tablata and cold cake await in the pages of this Belize cookbook. After a full day of exploring the offshore island cayes and the underground caves of Cayo; you may wish to lift your late night libido. Dive headfirst into some savory “strong-back” Belizean conch soup. You can pretend that the conch is fresh off Belize’s offshore barrier reef. Just imagine diving Belize’s crystal clear waters for lobster and conch. Your lobster burrito or fried fish would be even tastier if you just caught it with your own hands. This is entirely possible if you join the thousands of visitors who come from all over the world to dive the world famous Belize Blue hole. Congratulations, you have now discovered a great guide to delicious Belizean food, culture and cuisine. I Belize you can now cook up a storm with this Belize cook book. Do you believe it?? Great!! Then let’s get cooking….